Four times world champion Arambam Boby has become Mr. World for 5th time when he won a gold medal at the 8th WBPF World Bodybuilding and Physique Sports Championships 2016 (29th November - 5th December), Pattaya City, Thailand. Touted as the best Indian bodybuilder India has ever produced, Boby is a 3 times Mr. Asia and 12 times Mr. India holder. 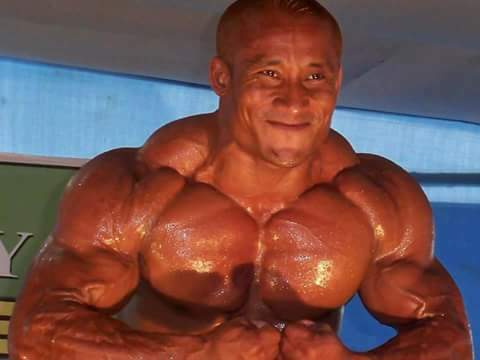 He contested in 80kg category, where, interestingly two Manipuri bodybuilders Irom Roshi and Sougrakpam Bungcha also contested in the same category. Now India's gold medal has increased to 3. Overall, Arambam Boby has amassed 7 medals in world championships. He has won 5 world titles, 1 silver and 1 bronze medal each. Although Boby could not win a medal in his first appearance in World Body Building Championship (Mr. Universe, Mumbai, India) in 2003, he went on to win back to back world titles in World Body Building Championship ( Varanasi, India ) 2010, World Body Building Championship (Malaysia, Malacca) 2011 and World Body Building Championship 2012, Bangkok, Thailand making him the first Indian bodybuilder to win world titles for three consecutive times. He missed another title when he had to settle for silver medal at the 5th World Body Building Championship 2013 held in Hungary. The bodybuilder who is now in Assam won a bronze medal in men's 75kg at the 6th World Body Building Championship 2014, Mumbai. After slipping the world titles for two consecutive times, Boby bounced back to claim his fourth world title when he won gold medal at the 7th WBPF World Bodybuilding and Physique Sports Championships 2015, Bangkok, Thailand. And now, as expected, he successfully defended his title when he won a gold medal at the 8th WBPF World Bodybuilding and Physique Sports Championships 2016 (29th November - 5th December), Pattaya City, Thailand. He is truely a living legend. In the championships, Washmir Epham of Manipur opened the gold account for India. Thingbaijam Sarita and Rakesh Nepram missed medals and won 4th positions. Altogether, eleven bodybuilders from Manipur represented India in the championships. Share this legend's story as much as YOU CAN. Thank you all.